In an effort to make interstate travel easier for concealed carry gun owners, State Representative Avery Bourne (R-Raymond) has signed on as Chief Co-Sponsor of House Bill 405. The legislation would allow concealed carry gun owners from other states to carry in Illinois if following the laws of our state and legally registered in their home state. House Bill 405 recognizes other states’ concealed carry permits and exchanges reciprocity agreements with other states that allow legal carriers to travel without risk of prosecution. Currently, federal legislation to allow this type of movement across state lines nationwide is being proposed in Washington, D.C. 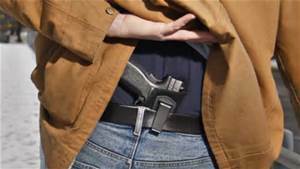 Concealed carry became legal in Illinois in 2012 after the U.S. Seventh Circuit Court of Appeals ruled that the state’s ban on carrying a weapon in public was unconstitutional. At the time, Illinois was the only remaining state in the country that did not allow concealed carry. Since then, there have been many pieces of legislation to ease the burdens within Illinois’ concealed carry law.